LeBron James speaks onstage during the Sports Illustrated Sportsperson of the Year Ceremony 2016 at the Barclays Center in Brooklyn, N.Y., on Dec. 12, 2016. 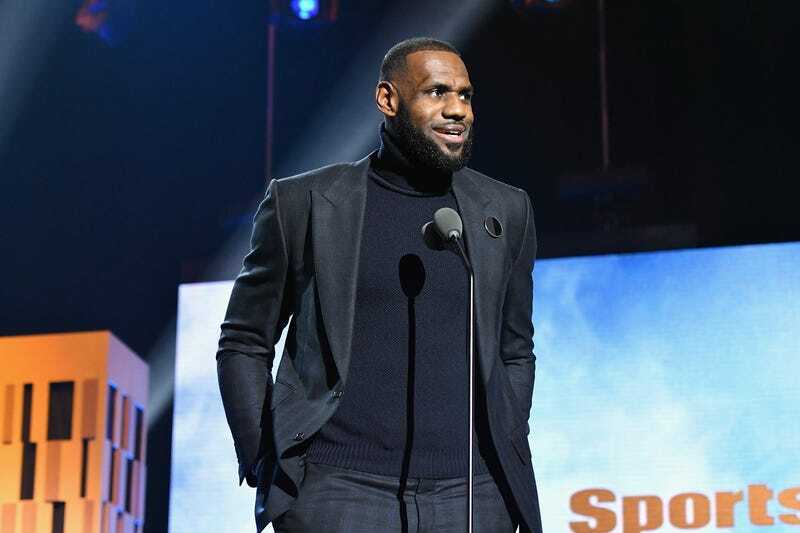 LeBron James was honored Monday in Brooklyn, N.Y., at the Sports Illustrated Sportsperson of the Year awards show. During his acceptance speech, James remembered other great athletes like Muhammad Ali, Jim Brown and Bill Russell, who inspired him and paved the way for other black athletes. James—who is the second athlete to win the award more than once; Tiger Woods is the other—was presented with the award by Jay Z, who also spoke about those who helped James, and made a jab at Phil Jackson's recent "posse" comments. "The son who honors and worships his mother, Gloria. The friend who put his posse in position. We know where we come from. We do understand where we come from, and the only difference between us and someone who has their MBA from Wharton or Sloan or Berkeley or Stanford is opportunity," Jay Z said. "LeBron James has provided his friends with that opportunity. And as we witness their development, and if we're looking up at the scoreboard, very few businessmen are better than Maverick Carter, Rich Paul, Randy Mims, and all the rest of the posse behind the scenes that make it look like they're just hanging out." Take a look at the speeches below at the 1:43 mark.